Mixtapes, your genie in a bottle; monsoon, your long-distance beloved; add both, and you have a potential cocktail Tito’s would love to feature in their menu card. And yes, your darling would love to give it a listen. 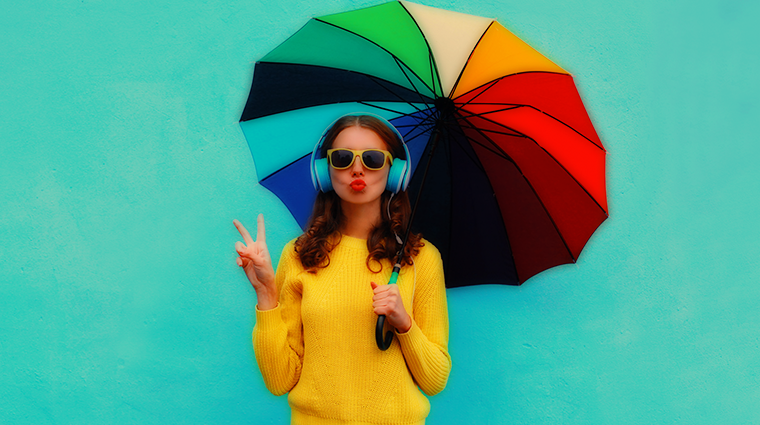 Now that monsoon is on its way out, it is time to attempt at creating an awesome sauce mixtape that will continue to chime the tunes of the season even when our window sills are dry. Start with the retro, start with some sepia, take out that Instax, and start preserving those fleeting moments zooming past. A monsoon mixtape without Rimjhim Gire Sawan is a blasphemy! The lyrics, the setting and the getting drenched of the on-screen couple – there is everything in this song that monsoon brings in. Keep both the versions (the first one sung by Lata Mangeshkar and the other one by Kishore Kumar) on your playlist; you are bound to get soaked in the love that the season promises . Time to croon to Is baar sawan dehka hua hai / Is baar mausam behka hua hai? While Raj Kapoor was busy portraying the New India immediately after our tryst with destiny, Pyaar Hua came out as a pure and innocent form of a rain and romance track– black and white days, a couple drenched in love, the duo of Raj Kapoor and Nargis are spotted celebrating love in the simplest possible manner. Perhaps the most euphoric love song that Bollywood has ever come across, Pyaar Hua Ikraar Hua speaks of the freshness that the season of love brings in. If Pyaar Hua Ikraar Hua represents the love in the difficult times, then Ek Ladki Bheegi Bhaagi Si brings to the fore the element of mischief that Love instills. The playful lyrics, the on-screen antics of Kishore Kumar and a rain-hit night – love can find its way even in the setting of a garage. Also, you have a choice here – go flirty but in a funny way like Kishore Da or go the ‘drenched but loving it’ way like Madhubala, and set fire to the rain. The sound of rain falling has a melody to it, don’t you agree? Say you are on your way to Karwar from Mangalore, and you find the familiar pitter-patter around you. This is the exact moment when the great RD Burman steps in. RDB’s swan song per se, this track has woven a melody which is incredible and sensational at the same time. Take that earphone splitter out and hum this together – let the Pancham magic engulf you completely. Another classic in this list, Deewana Hua Badal speaks what every romantic would sing at the very sight of rain. Though the setting has very little to do with monsoon, the lyrics – “Saawan Ki Ghata Chhayee” gives the exact feel of tripping in love. Rain. SRK. Oh come on – we are not fanboy/girling here – just stating the obvious. It might sound a bit filmy. But be it rain or shine, one ought to go back to SRK. If both of you are an exuberant couple like Madhuri-SRK, stop your car, get down and start grooving to Koi Ladki… sounds filmy? We would say Why Not! Another one from the most recent soundtracks which should be a permanent member is this Arijit Singh number. The lyrics, the tune, everything points towards a single direction – love. A mixtape and without A R Rahman in it, you must be joking! Nothing gets past us without ARR featuring in it (ok that is a bit too much). This composition, the melody, the soulful voice of Hariharan should make you lean on to your partner while you are on your way down to that place called Togetherville. Love changes its color with the passage of time. Every season has its own hues. Monsoon has its own shades too. At times, it echoes fulfillment, while on occasions it asks you to be patient. India celebrates rain and equates with the deepest and sincerest of emotion, love like no other race or country. Shut your eyes and get drenched.